"Like a kid in a candy store"
As some of you may know, I have a sweet tooth. 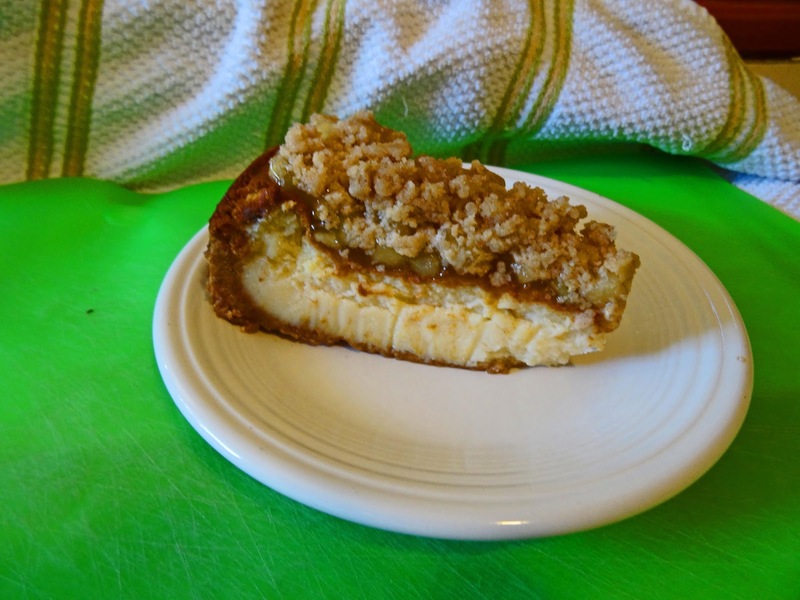 My Achilles heel in life is my passion for cheesecake. 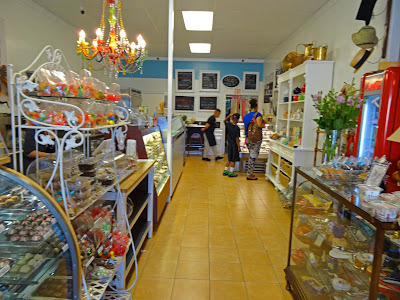 When I found out that an old friend from my working days at the salt mines opened a sweet shop in Hayward California, it was time for a 'Sweets Adventure'. The Racing Honda detoured from our journey home from the Asparagus festival. 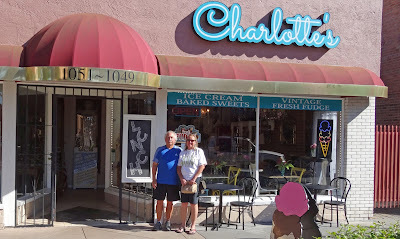 Our destination was 'Charlotte's', located in the revitalized downtown Hayward. Parking Karma was on hold today but we did snag a spot in the public lots one block away. We walked through the doors and the old saying never rang truer; I was 'like a kid in a candy store'. 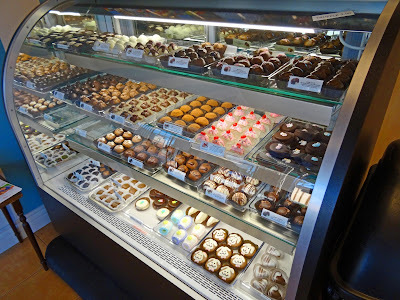 Fudge, truffles, cakes, and candies in all their beautiful sweet splendor were on display. Are you ready for this? There was a refrigerated display case that had at least a half dozen different flavored cheesecakes. Wow!. The fudge is house made like a lot of the other candies. I have forgot to mention ice cream. What sweet shop would not be complete with out it? Ron Rivera is an old work friend and owner of Charlotte's. Ron has a laid back personality and may have one of the best jobs in the world. Ron and his wife started making home made fudge and selling it at festivals. 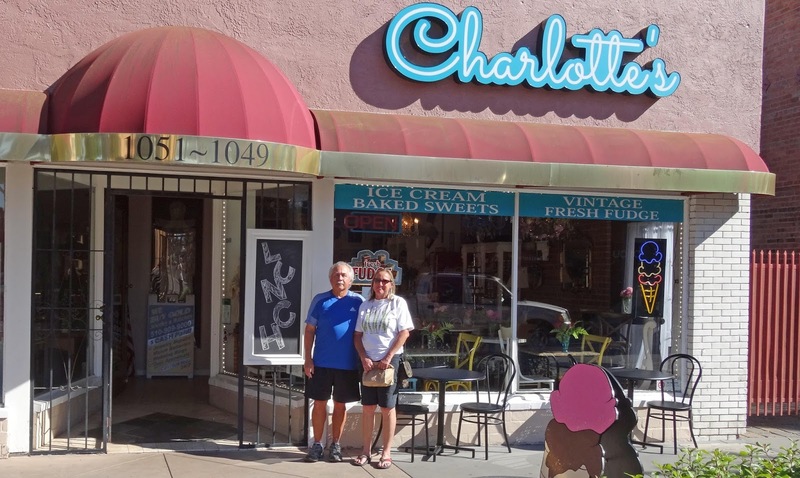 Their passion led to the opening of Charlotte's. Ron and I shot the breeze and he told me more about his shop. 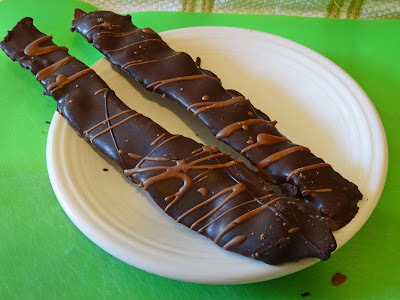 He casualty told me about the chocolate covered bacon. What? Chocolate covered bacon was not on display. I jumped up and politely asked the counter clerk to break out this secret chocolate covered bacon stash. Hallelujah! This Mad Meat Genius was one happy camper. We left the store with salted chocolate caramels, apple streusel topped cheesecake, truffles and of course chocolate covered bacon. Charlottes's is a destination Sweet Adventure. We shall return again and again. I now have a mission to try every flavor of cheesecake. Ron Rivera has a sweet gold mine of fantastic candy treats. See you there. Greg, I may have an addiction. President of Cookies, I am glad you like Charlotte's. The cheesecake is yummy. Mr. Brown, yeah yeah I know sweet tooth, parking Karma everything's wonderful.You can see my thoughts in my last post about parking Karma and Black bark. I may go to willie birds instead of Arts place. GWH Turkey dinner with stuffing and a bucket of gravy here I come. They were so accommodating and I was truly impressed. It is such a comfortable environment. For a buffet, it was delicious food. Alcoholic beverages were also great. Overall, these venues in Houston are great, and my favorite venue in the city.